Posted on May 20, 2007	by Linda S.
This post on my other blog Mish Mash… etc.. discusses my first step into the Art Trading Card realm. After a few postal SNAFUs, look what arrived in my mail…. Thank you so much, Lynn! They are so lovely. 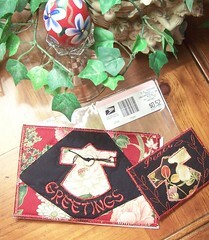 This entry was posted in ATC, Crafts, Embroidery, FPC, Handcraft, Handwork, Needlework, Sewing. Bookmark the permalink.